The San Diego Metropolitan Transit System or MTS is the public transit provider for Central, South, Northeast and Southeast San Diego County, California. It includes the cities of San Diego, Chula Vista, Coronado, El Cajon, Imperial Beach, La Mesa, Lemon Grove, National City, Poway & Santee. See San Diego Metropolitan Transit System bus routes. Division abbreviations: IAD = Imperial Avenue Division; KMD = Kearny Mesa Division; SBMF = South Bay Maintenance Facility; ECBMF = East County Bus Maintenance Facility; CPMF = Copley Park Maintenance Facility; Campo Lot = Caltrans Lot in Campo, CA for Rural Route 894; Boulevard Parking Lot = Caltrans Lot in Boulevard, CA for Rural Route 888. 305 has a MTS promotional wrap promoting various destinations in San Diego. 306 has a wrap promoting Route 992. 338-350 is wrapped in MTS Rapid Livery. 408-412 have since been sent off to East County division and renumbered to their respected South Bay numbering. Used for the Rapid BRT service. Option of an additional 118. Used for Rapid Route 215. ISL G ZF EcoLife KMD Used on routes 7, 150, Superloop routes 201, and 202 and Rapid Route 235. Some 2300's are now at ECBMF. Ex 414-441, 413, 412, 411, 410, 409, 408. 2725 no longer in service due to engine fire and sold to Transdev. In the process of being retired. Some are still in service at East County division. Used on Sorrento Valley Coaster Connection and limited service Minibus routes. Liquid spring rear suspension for smooth ride. 3003 is testing Orbital radio system. 31 new LPG mini buses to replace existing Chevrolet C5500 units. Same chassis as 3001-3006 but with LPG instead of gasoline. Clad grille instead of the the chrome grill as 3001-3006. Liquid spring rear suspension like 3001-3006. 3501 and 3502 have been retired from CPMF and replaced with the 31 LPG mini buses (3101-3131). 3503 and 3505 are being used for Rural routes 891 and 892. 3504 is being used for Rural Route 888. 3503-3505 to be replaced at a later date with new gasoline powered cutaways for Rural service. Replacing the ElDorado E-Z Rider and existing New Flyer C40LF units. To be used on Routes 709 and 950. First batch of Gillig CNG to replace the 2 remaining Phantoms and the 6000s. Originally held at SBMF, then transferred to ECBMF. Second batch of Gillig CNG for East County to replace 8101-8333. 8325 is being tested with an ISL G Near Zero engine. Fleet breakdown might not be 100 percent accurate. ISX12 Allison B500R ECBMF Re-wrapped in the Rapid Express livery, but a few remain in their original MTS livery. To replace existing NABI BRT. 11 New Zero Emission buses for Rapid Route 925 from Imperial Beach to Otay Mesa POE. Ordered and operated by San Diego County Transit. Transferred to MTS in 2002 shortly before/during retirement. All units were bought by Transit Sales International. All units were leased to DowneyLINK as 001-007 until 2003. 2 to YRT 8504 in 2003. 208 was an Altoona test bus. Most units were bought by Transit Sales International. Most were sold to various agencies in Ciudad Juarez, Mexico & Tijuana, Baja California. 213 & 214 were bought by Mexicoach and became #? & 67. Around 10 units were scrapped. (40102TB6V92TA) Detroit Diesel 6V92TA Allison HTB-748 328 to LADOT 91045. Some of the first Phantoms to feature the newer 1984 "TB" style rear end. Some units were spotted in Tijuana, Mexico after retirement; more than likely purchased from Transit Sales International. 522 was bought by a private owner and was spotted in a storage yard in southern California circa 2011. Its current status remains unknown. (40TB1026V92) Detroit Diesel 6V92TA Allison HT-747 545 caught on fire and was scrapped. 701-725 1974 Flxible 53102-8-1 Detroit Diesel 8V71N Allison VS2-8 713 retired early and bought by a school in North San Diego. The school retired it in running condition in the early 90s. High back seats with a single door. Retrofitted in the mid 80s with rear doors from retired SCRTD Flxible New Looks. Repowered from Detroit Diesel 8V71N's. Half the fleet was retired in 1997; most units were sold to various Canadian cities. Most units were rehabbed & repowered with Detroit Diesel Series 50 EGR/Allison B500R powertrains, but few units (most notably 1101, 1102 & 1105) kept their Detroit Diesel 6V92TA/Allison HTB-748 powertrains. 5 known units (all rehabs) were bought by Transit Sales International, however they will be parted out and scrapped. 1264 was repowered with a Detroit Diesel Series 50 engine. Some units were bought by Mexicoach. 1216 became 82, later renumbered 95; (Lic. plate: 8H51991). 1233 became 80; (Lic. plate: 8H51993). 1235 became ? ; (Lic. plate: 8H51992). 1237 became ? ; (Lic. plate: 8H51990). First C40LF's built by New Flyer. 1 known unit was bought by Zacher's Auto Salvage in Harbor City, CA. 1401-1429 1995 NFI C40 Detroit Diesel Series 50G Allison B400R Retired in 2011. Cummins Westport B Gas Plus Allison B400R 1527 was converted into an ISE Natural Gas-Electric Hybrid bus. 1615 was bought by (or donated to) Miramar College in San Diego for their diesel tech program. It is still in operable condition as of December 2017. 1605, 1610, 1613, 1614, 1618, 1621 & 1626 were bought by an unknown 3rd party/reseller. They were sold to Tourcoach, converted into single door suburbans and became T188-T194. C Gas Plus Allison B400R Retired in 2014-2016. 1901-1913 2001 NFI D60LF Detroit Diesel Series 50 EGR Allison B500R Retired in 2015-2016. Many units were bought by Transit Sales International/Complete Coach Works. C Gas Plus Allison B400R 2001 models. To be replaced with the 31 LPG mini buses. One unit is used by JPL shuttle (#320) for Caltech shuttle service. 6001-6016 2001 NFI D40LF Cummins ISC Allison B400R 6007, 6008 & 6011 were sold to Port Authority of New York and New Jersey 720, 719 & 772. 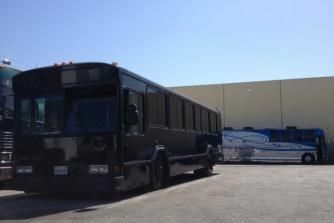 8030 was converted into a party bus and was listed on ebay in Los Angeles, CA throughout 2015. 8031-8035 were bought by Transit Sales International; spotted circa 2011-2013. Series 50 Allison B400R Ex 041-046. Campo Lot will operate the D40LFs until 2018 at the earliest unless MTS decides to replace them with something else. 8101, 8108, 8130 and 8132 were sold to Port Authority of New York and New Jersey 766, 773, 765 and 718. San Diego Trolley, Incorporated (SDTI) is the operator of the LRT and is a subsidiary of San Diego MTS. 1001 will stay at the rail yard as a historical vehicle, though plans are unknown. 1031-1050 1989 Siemens-Duwag U2 1055, 1066, 1068, 1070-1071 were sold to Mendoza, Argentina in 2010. 4001-4065 2011-13 Siemens S70 4064 holds the world record for longest distance (13 mi) using a battery backup pack. ↑ 1.0 1.1 San Diego Metropolitan Transit System Awards New Flyer a Contract for up to 165 Articulated Xcelsior Bus, www.newflyer.com, retrieved on 2013-01-20. ↑ San Diego Metropolitan Transit System Exercises Options for Ten 60-Foot Xcelsior CNG Buses, New Flyer Industries. Dated and retrieved on March 3, 2017. ↑ South Bay Rapid, SANDAG Region. Dated and retrieved on June 3, 2017. This page was last modified on 21 March 2019, at 03:41.